The Crown Estate has said the timetable for its leasing of the seabed and installation of renewable energy devices by 2020 remained on schedule. It said legal paperwork opening the way for companies to harness wave and tidal power will be signed by the end of March next year. 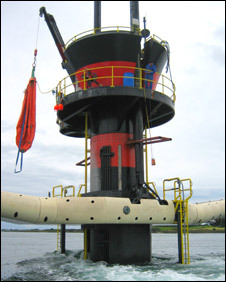 The Crown Estate, which owns the seabed around the UK, said power could be generated for 500,000 homes by 2020. But Thurso and Wick Trade Union Council said the process was taking too long. The council is eager to see new sources of work created to compensate for those that will be shed during the decommissioning of the defunct Dounreay nuclear power complex near Thurso. Chairman Derrick Milnes said: "If we are not careful we are going to lose the initial impetus we had." Earlier this year, the Crown Estate announced that it had received 42 bids for the wave and tidal programme in the firth between the far north mainland and Orkney. It said the level of interest exceeded initial expectations and more projects than originally planned were being taken forward to the negotiation phase.